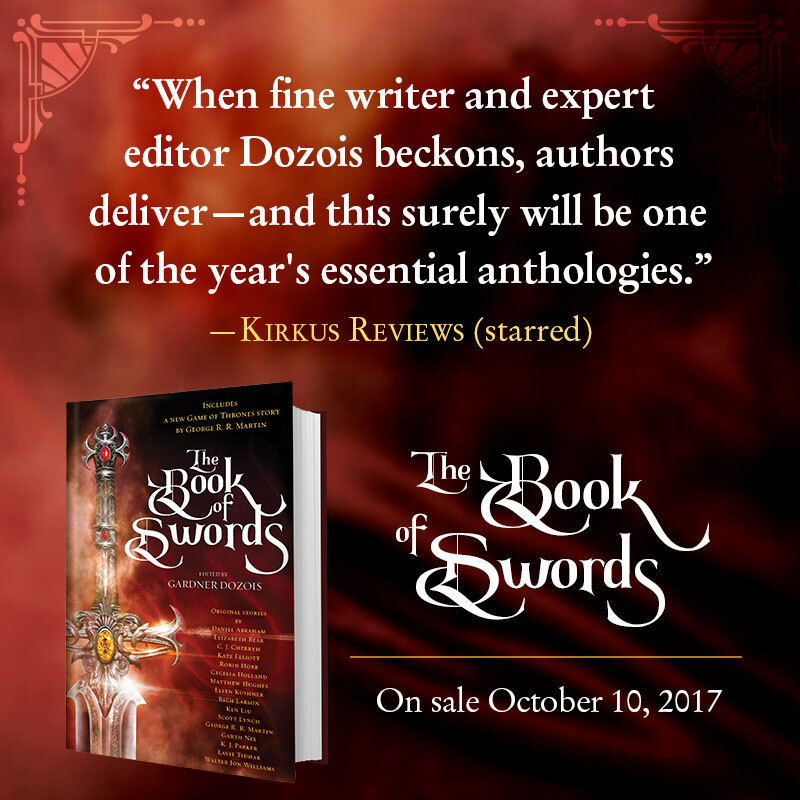 The Book of Swords, edited by Gardner Dozois and with my story “The Triumph of Virtue,” is now available for pre-order. You can order the book at your favorite local bookstore, or via Amazon, Barnes & Noble, or (for ebook only) Google, Kobo, or iBooks. The release date is October 10, but why wait? You might actually want to have a hardback of this, because of who’s in the table of contents. Me, certainly, but also George RR Martin with a new Ice and Fire story, plus Robin Hobb, Ken Liu, CJ Cherryh, Kate Eliot, Elizabeth Bear, Daniel Abraham, and Many, Many More. My own story, “The Triumph of Virtue,” is adapted from a few chapters of my forthcoming novel Quillifer, itself available on October 4. Since Quillifer is a book with a fairly tangled plot, the adaptation ended up being far from straightforward— I had to chop a lot of material that didn’t have to do directly with the excerpted story, shift the cast of characters, alter emphasis here and there, and make the ending more, well, more different. Reading the two side-by-side would be instructive for anyone needing instruction in that sort of thing. But in the meantime, feel free to pre-order the book. Because It Is There, and Awesome. Okay, C. J. Cherryh has a post on her blog as well about The Book of Swords; I haven’t heard from Elizabeth Bear yet, but I’m off to Kobo to pre-order now. Starred review from Kirkus is impressive, but more important is that some of my favorite authors have new stories for me to read.